In this fascinating book, published in 2007, author Jack D. Forbes brings to light many possible incidents of pre-Columbian travel from the New World to the Old. While a transatlantic crossing from East to West was an arduous and perilous voyage for early European mariners, Forbes argues that a journey in the opposite direction was much easier due to the assistance of the Gulf Stream current. He also asserts that Native Americans certainly had the nautical expertise to pull off intercontinental voyages, and their traversing of the Atlantic may not have been merely haphazard and accidental, but rather habitual and systematic. The first American visitors to Europe were inanimate objects—logs, seeds, carved wooden objects, and the occasional corpse. The Irish port of Galway, positioned like a Gulf Stream catcher’s mitt, was the landing ground of much of this flotsam and jetsam, so much so in fact that some residents were able to build their houses with American wood. It was in Galway, in 1477, that Christopher Columbus met two Native American voyagers who had drifted into the harbor in boats constructed of dugout logs. Due to his mistaken conception of geography, Columbus thought these travelers were inhabitants of Cathay (China), but Forbes provides copious documentary evidence to indicate that they were, in fact, Americans. Forbes argues quite persuasively that Columbus’s contact with these American visitors was instrumental in influencing his decision to make his monumental journey 15 years later. It’s already common knowledge, of course, that Columbus was not the first European in America. Norse mariners had founded settlements in Greenland and Newfoundland as early as the 10th century. Forbes covers the likelihood that these Norsemen brought Americans back to Europe, and the possible genetic influence they may have had on the population. In addition to the Galway incident, Forbes examines many other possible European landings by American visitors, ranging from prehistoric times to ancient Rome to medieval Germany. Much attention is devoted to accounts of Inuit kayakers who ventured to Iceland and Scotland. Forbes really leaves no stone unturned. He presents every possible theory of American travel to Europe, then explains which ones are based on informed speculation and which are founded on hard archaeological and documentary evidence. The book concludes with a chapter on American travelers to Europe after 1492, many thousands of which were brought over as slaves, and others who came as guests, ambassadors, or independent travelers. I’m not a scholar in the field, just an armchair archaeological enthusiast. I found the subject matter captivating, but the text is at times a relentless barrage of data. The book is directed at Forbes’s scholarly peers, with little attempt made to appeal to a broader general audience. That’s not meant as a criticism, just a warning for the casual reader. The only noteworthy problem with this book is that it suffers from an inadequate investment in cartography. There are only three maps in the book, two of which are not sufficiently detailed to adequately serve the passages to which they relate. In the dullest portions of the book, Forbes spends far too many words describing the position of islands and continents on early maps, when a simple diagram would have been far more efficient and effective. Despite this shortcoming, Forbes’s research is stunningly thorough, his arguments are persuasive, and his conclusions are convincing. The American Discovery of Europe is an enthralling read and an eye-opening education. This beautiful showcase of Andrew Wyeth’s art differs from other books on the artist in two main respects. First, it concentrates specifically on his landscape art, as opposed to his portraits and figurative paintings (although a few of the works do contain figures within the landscape—Christina’s World, for example). Secondly, it places emphasis on his heretofore largely unknown work in watercolor. The meticulously crafted tempera paintings for which Wyeth is famous are also well represented here, but intermingled with the more vigorous, slapdash watercolors, allowing you to compare and contrast the two styles. The two bodies of work are quite different in tone and execution, yet Wyeth’s exceptional talent for expressing the structural beauty and textural randomness of nature is equally evident in both media. The brief text of the book is neither good nor bad. Curator Beth Venn’s essay gives some valuable insight into Wyeth’s working methods in watercolor. The other two essays offer mostly critical analysis, discussing whether Wyeth is a realist or abstractionist, a modernist or a traditionalist. Other than offering a few choice quotes from the artist himself, they don't really tell you much of anything you can’t figure out just by looking at the images. The uncomfortable typographic design of the book makes reading the text literally painful, so you may want to avoid the words altogether and just feast your eyes on the 150+ color plates of Wyeth’s magnificent work. The images are beautifully reproduced in vivid detail and brilliant color. Admirers of Wyeth’s art will never get tired of browsing through this book. For those artistically inclined, a little time spent paging through this gallery of images will make you want to grab your paints and head out for the nearest wilderness. The Game is a boxing novel by Jack London, first published in 1905. Though there’s little that’s groundbreaking or profoundly deep about this brief narrative, it’s an entertaining piece of genre fiction written with a literary proficiency that lifts it above the level of mere pulp fiction. Joe Fleming and his girl Genevieve are an innocent young couple who, after a virginal courtship, have decided to tie the knot. The two naive young lovers share a pure and simple adoration of one another, but Genevieve does have serious reservations about the relationship, due to the obtrusive presence of Joe’s beloved mistress. Joe’s mistress, it must be stated, is not another woman, but the sport of boxing. Genevieve cannot understand Joe’s desire to participate in such a brutal and primitive activity. For the sake of their marriage, Joe agrees to end his boxing career with one last bout. Wishing to impress his bride, Joe invites her to witness the match. Thus, on the eve of their nuptials, Genevieve masquerades as a man and sneaks into the arena to watch Joe’s final fight. Between the lines of this straightforward sports novel, frequent readers of London will recognize his obsession with evolution. Despite Joe’s usually mild mannered persona, once inside the ring he is the living embodiment of Darwin’s “survival of the fittest”. Although Genevieve abhors the brutality of boxing, she can’t help but be aroused by the primitive strength and savagery of her man in action. Underneath their civilized romance bubbles the primordial stirrings of their animal natures. By making Genevieve a spectator at the event, London turns the boxing ring into a representation of Darwinian sexual selection. London truly loved the sport of boxing, and that love is apparent throughout this story. The epic match between Fleming and Ponta is no mere slugfest, but a celebration of the pugilistic art. To the 21st-century reader, who’s probably seen fifty boxing movies over the past few decades, the plot and characters of this hundred-year-old book may seem a bit familiar, but London handles the material so skillfully that the entertainment value generated by The Game is well worth the brief hour spent reading it. The Voyage of the Beagle is Charles Darwin’s account of his nearly five-year trip around the world as natural historian on board a British survey ship. Though the book is named after the ship, it contains very little description of life at sea, and concentrates almost exclusively on the details of Darwin’s many excursions on land. Darwin’s voyage on the Beagle is primarily remembered for his discoveries on the Galapagos Islands, but that particularly destination only occupies one short chapter, though it is the most interesting portion of the book from the standpoint of biological science. The large majority of the book’s narrative takes place on the mainland of South America, in the lush jungles of Brazil, the pampas of Argentina, the harsh coasts of Tierra del Fuego, and the deserts of Chile. The itinerary also includes Tahiti, Australia, New Zealand, the Cape of Good Hope in southern Africa, and numerous other islands in the Atlantic, Pacific, and Indian Oceans. One would think that The Voyage of the Beagle, being a first-hand account of world travel, adventure, and discovery, would be more thrilling and engaging than Darwin’s most famous book, the complex scientific treatise On the Origin of Species, but that’s not the case. On the Origin of Species presents a well-structured scientific argument in which each idea builds upon the one before it, creating a snowball effect which captivates and excites the reader. The Voyage of the Beagle, on the other hand, is basically a collection of raw empirical data arranged in roughly chronological order. Occasionally Darwin will use that data to construct a hypothesis, for example in regards to the varying beaks of the Galapagos finches or the formation of the world’s coral reefs, but there’s no overarching theory or argument that unites the book as a whole. The primary value of The Voyage of the Beagle is its contribution as a precursor to the development of On the Origin of Species. Though Darwin is primarily known as a biologist, he does not limit himself to that field and is equally articulate when expounding on geology, meteorology, anthropology, or even politics. In fact, in this book he probably spends more time discussing geology than he spends on zoology and botany combined. The text represents a combination of scientific research and travel writing. While the scientific portions of the book sometimes take the form of laundry lists of species or natural phenomena, the travel writing is quite good. Darwin eloquently captures the thrill of entering a foreign landscape for the first time, discovering a species never before seen by European eyes, or encountering the unfamiliar inhabitants of a distant land. He shows great respect for the culture of the gauchos of Argentina, and he truly relished the wilderness adventures he shared with them. One of the great benefits of this book is that it gives us insight into Darwin as a human being. It’s a far cry from the image of scientist as lab rat. Yes, he was an erudite scholar who seems to have read everything under the sun, but he was also a man of action who was not afraid to get his hands dirty. I’m a big fan of the Wordsworth Classics series of paperbacks, and often sing their praises in my reviews, but their edition of The Voyage of the Beagle left me wanting more. The introduction is very good, providing valuable context for the voyage, yet it lacks even the simplest of maps, and if ever a book needed a glossary it’s this one. The copious use of geological terminology and Latin names of species hinder this book’s accessibility to the general reader. The more well-versed you are in the sciences, the more you will enjoy it. In 1845 Henry David Thoreau built a 10 x 15 foot cabin in the woods on the shore of Walden Pond, near Concord, Massachusetts, and lived there for two years, two months, and two days. Out of this experience came the book Walden, first published in 1854. Embarking on this sojourn of solitude was an attempt to escape the distractions, conventions, and frivolous fashions of urban society, to reconnect with the essentials of existence, and to get at the very root of life. By practicing a simpler way of living, engaging in a more direct relationship with nature, and replacing the hubbub of civilization with quiet contemplation, Thoreau hoped to experience life more fully and richly. The result of this experiment is this classic of American literature, an inspirational combination of philosophy, poetry, and natural history. Walden is a manifesto of nonconformity and individualism. Thoreau urges readers to forget how society says you should live and to live by your own compass, by what you feel is right. Disregard public opinion and take command of your own fate. The materialistic culture of modern, civilized society distracts us from finding our true direction in life. Solitude and introspection are the means by which to recover one’s bearings. Through a simplified, more natural way of life, Thoreau was able to strip away the unnecessary psychic baggage of society’s traditions and expectations, allowing him to examine his life objectively. By Thoreau’s account, even in the mid-19th century Americans were slaves to the rat race, working themselves like beasts of burden, ever accumulating debt, all for the sake of luxuries that were supposed to bring pleasure to their lives but only compounded their misery. He begins the book by laying bare all the absurdities of this unhealthy cycle, insightfully picking apart the ills of his contemporary society with a biting, sarcastic wit. It is remarkable how well his critique of “modern life” has held up over the past 150 years. His opinion of the railroad, for example, can be just as accurately applied to today’s internet when he questions the benefit of all this high-speed communication if people have nothing meaningful to say to one another. “Most of the luxuries, and many of the so-called comforts of life,” he writes, “are not only not indispensable, but positive hindrances to the elevation of mankind.” To experience the true joy of life, quit living for your possessions and get your mind and spirit in order. Though the language of Thoreau often sounds antiquated to the 21st century reader, the message of Walden is still as vital as the day it was written. In describing his two years in the woods, Thoreau provides poetically beautiful and scientifically accurate depictions of the scenery, inhabitants, and processes of the natural world. Yet for Thoreau these empirical observations are only a means to an end. As a member of the Transcendentalist movement, Thoreau saw nature as a medium through which the higher philosophical truths of the universe are revealed. It is to nature that we should turn to seek guidance in living our lives, not to the traditions, mores, and manners agreed upon by civilized society. One need not retreat to the wilderness to lead a natural life. In fact, Walden Pond was only a few miles out of town, and Thoreau had visitors almost daily. Isolation was not the point of his experiment, but rather self-reliance, in thought as well as deed. To find direction in life one must seek inwardly. Nature is free to all, and all are free to learn its lessons and live by them. Let Walden be your guide. There is profound wisdom to be gleaned from each paragraph for those willing to seek it. Originally published in 1930, Flowering Judas and Other Stories was the first collection of short stories by Katherine Anne Porter. These twelve selections constitute a remarkable literary debut, impressively showcasing not only Porter’s exceptional talent but also her tremendous range. Eight of the twelve stories are set in Mexico, a country in which Porter lived, worked, and traveled. The title selection is the best of several masterpieces in the book. “Flowering Judas” tells the story of a 22-year-old American schoolteacher who moonlights as a revolutionary. The reality of the revolution falls far short of her preconceived, romantic notions. The head agitator she serves seems more concerned with bedding her than with the rebel cause. Even worse, she fails to live up to her own idealistic image of a revolutionary because she’s too tied to her Catholic, American, bourgeois past to wholeheartedly devote herself to the fight. Throughout the book, Porter celebrates the beauty and romance of Mexico while simultaneously stripping away the pretty veneer to expose the often harsh and ugly reality underneath. She explores the Mexican experience from various perspectives: rural and urban, rich and poor, agrarian and intellectual, native and outsider. In “Hacienda,” a Russian film crew shoots a movie which sounds an awful lot like Sergei Eisenstein’s Qué viva Mexico! When the company of condescending outsiders occupies a hacienda where pulque is manufactured, cultural and class distinctions become glaringly apparent as the real life events of the inhabitants and the fictional narrative of the film become inextricably entwined. Porter is a fantastic writer, but there are still some weak links in this chain. “The Martyr,” a fable about an artist who loses his muse, is a little too lighthearted to achieve any profound effect. The excessively brief “Magic” also seems a bit pointless. The least satisfying entry in the collection is “Theft,” which is told in deliberately obscure, impressionistic prose reminiscent of some of William Faulkner’s more self-indulgent ramblings. Thankfully, she rarely resorts to this sort of gratuitous verbal chicanery, though she’s not averse to narrative experimentation. Elsewhere she uses the stream-of-consciousness technique to far better effect, as in “The Jilting of Granny Weatherall,” told from the point of view of a dying 80-year-old-woman. In the excellent “Rope,” she deftly interweaves the competing interior monologues of a bickering married couple. A common theme running through these stories is regret—regret for missed opportunities, lost loves, or loves retained long past their prime. In the exemplary piece “The Cracked Looking-Glass,” a married couple resides on a farm in Connecticut, the husband thirty years older than the wife. The woman misses her former exciting life in New York City, laments her attachment to an aging husband, and longs for a reunion with a younger man she once knew. Like many of the stories included here, the conclusion relies on how she reacts to these regrets and whether or not she can come to terms with them. Porter demonstrates a clairvoyant insight into human psychology and a masterful skill at crafting riveting prose. The few low points in this collection are not the mistakes of a bad writer but rather the failed experiments of a brilliant scientist, necessary pitfalls in the course of a stellar career. This collection is a landmark work of literature by one of America’s greatest authors. Nana chronicles the rise of the title character from lowly street girl to a queen of the whores in Second Empire Paris. Part of the fun of reading this book is to imagine how shocked the audience of Zola’s time must have been when they first read this novel. Nana makes Madame Bovary look like Mother Teresa. A series of men from various levels of social status become involved with Nana, and the only way to satisfy their lustful obsession with her is to rid themselves of every drop of money and every shred of dignity. At one point Zola says it were as if the entire economy of France had passed between her legs. The book offers serious commentary on the decadence and decay of Parisian society in the late nineteenth century. At the same time, it’s a wonderful piece of pulp fiction. The events and characters are exaggerated in some parts to comedic effect, but under the satire lies a strong indictment of loose mores and shallow pleasures. Nana is a symbol of the political, cultural, and moral degradation of France. (Her contemporary American cultural equivalent might be . . . Paris Hilton, for example.) As a literary character, Nana has the paradoxical effect of being likeable even while we despise everything she stands for. This book is the ninth volume in the Rougon-Macquart series (Nana is the daughter of Gervaise Macquart of the book L’Assomoir), but it stands alone as a work of literature. Previous knowledge of Zola or his works is not necessary to enjoy this novel. This book is a worthwhile read for anyone who appreciates great literature. This collection is not quite the “Complete Works” it claims to be, but it probably contains 95% of London’s published writings, which is a great feat for an author so prolific. The most glaring omission is the short story collection On the Makaloa Mat, which contains some of London’s best Hawaii Stories like “Shin-Bones”, “The Water Baby”, and “The Bones of Kahekili”. Also absent are The Kempton-Wace Letters, which he co-wrote with Anna Strunsky, and The Assassination Bureau, Ltd., which was completed after his death. Since these two were collaborative works, it’s possible they may not be public domain, therefore their absence would be understandable. Other than that, all that’s missing are “minor” works: a few plays, some non-fiction journalism pieces, some of the stories he wrote during high school. None of his poetry is included. The novel The Star Rover appears under its alternate title, The Jacket. The short stories are arranged in the context of the collections in which they were originally published, which is good. There are four collections here that are not considered part of the official Jack London canon: Brown Wolf and Other Stories, A Collection of Stories, Stories of Ships and the Sea, and Tales of the Klondyke. These four collections contain mostly stories repeated from other collections, but they also have some obscure stuff not available elsewhere. As far as ease of use is concerned, this collection could be more user friendly. There is an interactive table of contents which allows you to click on individual volumes, however each volume does not have its own table of contents. So if you click on The Strength of the Strong, for example, it takes you to the first page of the first story, but if you want to know the other six stories that are included in that volume, the only way you’re going to find that out is by scrolling through the entire volume. For an author who wrote so many short stories, it would have been useful to include some way of easily accessing individual stories, like an alphabetical index. Overall it’s a fantastic collection of work by America’s greatest author. Downloading them all in one inexpensive chunk sure beats hunting for the lesser-known works in used book stores, libraries, or on ebay. I purchased this collection a year ago and have since read six of the pieces included: Les Chouans, Lost Illusions, Farewell, Sarrasine, At the Sign of the Cat and Racket, and Father Goriot. (Click on the “Balzac Honore de” tag in the right-hand column of this blog to read reviews of individual works.) I found none of the annoying typographical errors often present in public domain Kindle files that are generated by optical character recognition, which leads me to believe that someone actually took the time to proofread and edit the text. The English translations are all about a hundred years old, but contain no overly archaic terminology that would hinder a reader’s understanding. They retain just enough of an antiquated feeling to remind you that you’re reading a distinguished work of classic literature. For those who don’t know, almost all of Balzac’s writings fall under the heading of the Comédie Humaine, a series of about 100 novels and stories loosely connected by recurring characters. This Kindle file features two interactive tables of contents, which are very convenient and easy to use. One arranges the pieces according to the way Balzac classified them within the structure of his Comédie Humaine. The second table of contents lists the titles in alphabetical order. In works composed of multiple novellas, for example Lost Illusions or The Thirteen, both the parent title and the title of each individual part are listed. Balzac’s works have often been published under more than one English title, in addition to the original French title, so if at first you can’t find a specific work included here, check Wikipedia for alternate titles. This file contains the complete Comédie Humaine, plus a handful of additional works, including the Droll Stories and five plays. Some but not all of the pieces contained in this collection end with a list of recurring characters and the other novels of the Comédie Humaine in which they appear. While this is slightly helpful in choosing further works to read, for those really interested in the overall structure and continuity of the Comédie Humaine, I would recommend downloading Repertory of the Comédie Humaine by Anatole Cerfberr and Jules François Christophe, available for free from Project Gutenberg. Balzac’s works and their English translations are all in the public domain, so you can get all of these works for free elsewhere. However, if you are a fan of Balzac it’s worth spending a couple of bucks just to avoid the hassle of downloading all these works individually. This well prepared collection presents Balzac’s amazing oeuvre in a satisfying, user friendly package. Pantheism is a metaphysical view that asserts that God is inseparable from the physical universe. This God, however, bears little resemblance to the Christian, Moslem, or Judaic God. In fact, among Pantheists the word “God” is often interchangeable with words like “Nature”, “Soul”, or “Mind”. Most religions of the world are dualistic philosophies which view the world as being comprised of two substances, matter and spirit. Most Pantheists, on the other hand, are monists who believe the universe is composed of only one substance (matter), and that any divinity, intelligence, or spirit must be an inherent quality of that matter. Thus this divinity permeates the entire universe and inhabits all things. Everything is a part of and subject to the governing order of the natural universe, and nothing, not even God nor human consciousness, resides outside of physical reality. Many of the ancient Greek and Roman philosophers were Pantheists, as were the early Hindus and the Chinese Taoists. The most prominent Pantheist in the Western philosophical canon is Baruch de Spinoza, in whose work John Toland, the author of Pantheisticon, was certainly well-versed. Toland was an Irish philosopher and outspoken freethinker who often published writings attacking conventional religious views. Pantheisticon was first published in Latin in 1720; the first English translation appeared in 1751. It is a brief booklet, little more than 100 small pages. Toland devotes about half the book to an explanation of the basic concepts of Pantheism. What he has to say on the subject is in many ways a rehash of Spinoza, but less mathematically logical in its construction and harder to understand. At times it’s even difficult to determine whether Toland is proposing a monistic or dualistic form of Pantheism. He makes digressions into physics and astronomy that do little to clarify his position, especially when penned in the prose stylings of three centuries past. In the second half of the book Toland presents something far more original and unique. He asserts that throughout the Europe of his time there existed Socratic Societies, brotherhoods of Pantheists who, in the tradition of the ancient Greeks and Romans, gathered for banquets and engaged in philosophical discourse. Toland transcribes the “Form” of these meetings, a sort of liturgy that’s to be recited at these secret dinners, which include many quotes from their patron saint Cicero and call-and-response hymns devoted to the triumph of reason over superstition. Whether or not societies of this sort actually existed, the sort of pan-European network that Toland proposes here seems unlikely. It’s more probable that Toland’s intention is to inspire such brotherhoods, and create for the disciples of reason something resembling an organized religion. If you really want to get a thorough understanding of Pantheism, this is not the book to read. For that I would suggest The Ethics by Spinoza. Nevertheless, if you are a freethinker, you’ll get a big kick out of the Pantheisticon. It gives one the feeling that you’re not alone in the world, that somewhere out there exists a brotherhood of like-minded heathens who value reason over superstition and scientific investigation over dogma. The book is also well stocked with quotable gems, for example, “The Sun is my Father, the Earth is my Mother, the World’s my Country, and all Men are my Relations.” Words to live by for the human race, to be sure. Harry Haller envisions himself as having a dual personality. One half of his nature, the human side, longs for social interaction and a comfortable bourgeois existence. The other half, his animal side, which he refers to as the Steppenwolf, craves solitude and the fulfillment of its savage desires. Unable to reconcile these two halves of his nature, the aging Haller finds himself depressed and filled with revulsion for his pointless, insignificant life. He sets his mind on suicide until he chances upon a sympathetic woman, Hermine, who rescues him from his self-imposed isolation, introduces him to a new social circle, and teaches him to enjoy life again. Though that brief description may sound like the beginning of a romance novel, Haller’s mysterious savior does not so much resemble a love interest as she does a Virgil guiding Dante through Hell. Hermann Hesse is known for introducing ideas from Eastern philosophy and religion to the minds of Western readers. Though the Oriental imagery is not as overt here as in some of his other novels, there is still a prominent undercurrent of Buddhist and Hindu thought. Haller serves as an example of how one’s view of the self or of his own “personality” is merely a construct of self-crafted illusions. In reality the soul is as multifaceted as the world at large, and this restrictive self-definition only serves to hinder him from attaining peace and fulfillment. The true self can only be discovered by breaking through this psychological obstacle, negating the illusory self, and opening oneself up to the myriad possibilities of life. In Steppenwolf, Hesse expresses this largely Eastern concept through the language of European intellectualism. It reads more like a psychoanalytical treatise than a Buddhist sermon. The novel liberally departs from realism, as dreams and hallucinations intermingle with the concrete events of Haller’s life, their boundaries often obscured. Rather than a stream-of-consciousness narrative, this novel might be described as stream-of-subconsciousness. On his strange journey of self-discovery Haller encounters Goethe and Mozart, and explores the Magic Theatre where parallel visions of his existence intersect. These hallucinatory departures can get pretty bizarre, at times resembling the sort of pretentious Euro-surrealist film clips that Saturday Night Live used to lampoon in their “Sprockets” sketches. In Hesse‘s skillful hands, however, these disjointed scenes unite to form a vivid encapsulation of the paranoia, disappointment, and disgust felt by many a liberal intellectual as Europe was recovering from one horrible world war, only to embark on another in the not too distant future. Steppenwolf is much more than just a snapshot of the mind set of its time, however. Though first published in 1927, much of what this novel teaches about human nature is timeless. The opposition between the solitary individual and his social obligations to mankind is an eternal conflict, one that has only been compounded by the dehumanization of modern society. Hesse understands this conflict with precise clarity and expresses it with a fearless originality that enlightens and amazes. When I first read this book as a young, angst-ridden bohemian, it truly struck a chord with me. Rereading Steppenwolf now as a full-fledged member of the bourgeoisie, approaching middle age, I find the lessons learned are different but no less profound. In his native Mexico, Lepoldo Méndez is highly regarded as one of the country’s great artists, with a stature just below that of the “big three” (Rivera, Orozco, Siqueiros). 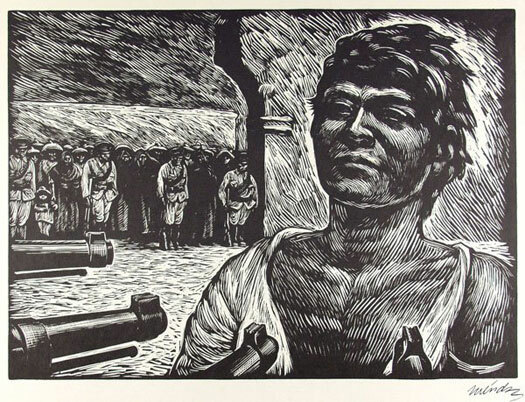 Through a mixture of powerful social realism and biting political satire, his masterful woodcut prints embody the socialist ideals of post-Revolution Mexico, vividly capture the living conditions of the Mexican working class, and fiercely denounce corruption and war. The text of this book is in Spanish. 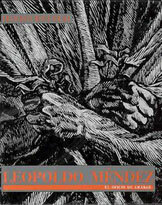 It gives an excellent overview of Méndez’s life and career, from his early work in the Futurist-inspired Stridentist movement to his participation in the Liga de Escritores y Artistas Revolucionarios (LEAR) to his leadership of the revolutionary print collective Taller Gráfica Popular (TGP). Also discussed in detail are the influence of José Guadalupe Posada on his art, and Méndez’s work in the field of movie titles. The book also reproduces two articles that Méndez wrote, one from 1926 about mural painting and one from 1947 on Mexican art in general. It ends with a chronology of Méndez’s life which is so rich in detail it could serve as a biography in its own right. 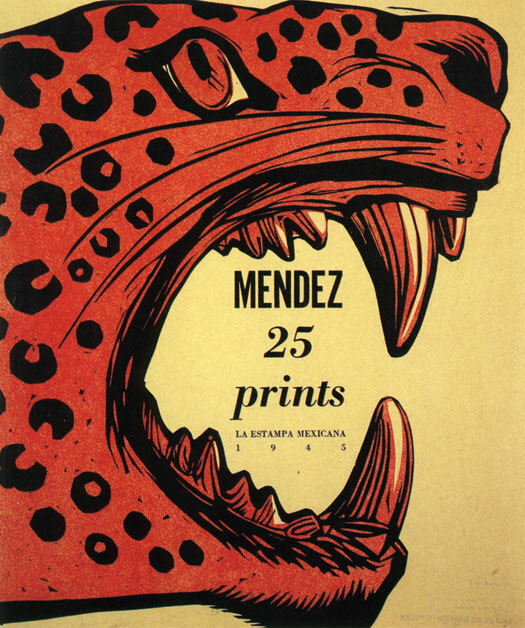 This book contains 125 illustrations of Méndez’s work, spanning his entire career, all beautifully reproduced, in high contrast black and white or in full color when appropriate. The design and printing of the book is excellent with the exception of the horrible choice of text font (Bodoni bold extra condensed) which, though attractive, is difficult to read. This book is the best I’ve ever seen on Méndez. 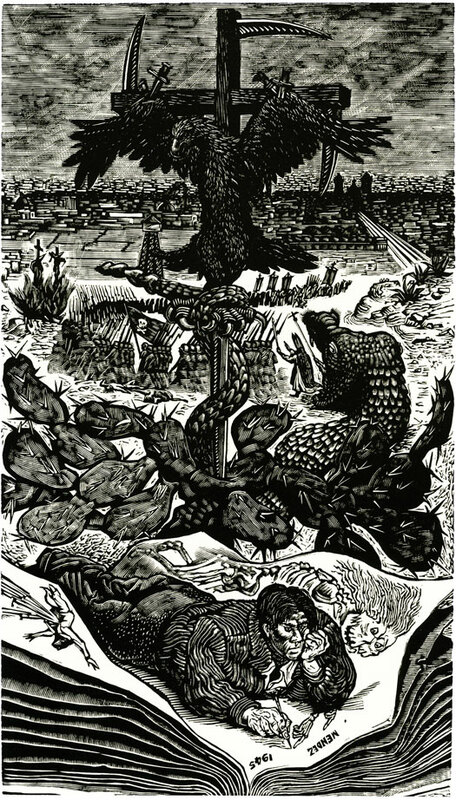 For a comprehensive study of the man and his work, probably the only real competition is Deborah Caplow’s book Leopoldo Méndez: Revolutionary Art and the Mexican Print. That book is currently in print, and the text is in English, but the illustrations in the Reyes Palma book are far superior in quality. Even if you can’t read Spanish, if you love Méndez's prints you won't find a more beautiful collection of his work than this one. I'm a big fan of London, and have (so far) read probably 2/3 of his published work. I always prefer, when possible, to read his stories in their original collected volumes, rather than in the many “greatest hits” collections of his work. This volume is the exception to that rule. Earle Labor, a renowned London scholar, has put together the ultimate “desert island” volume of London’s work. All of the best stories are here, as well as an excellent collection of his non-fiction writing, letters, and biographical material. The Call of the Wild is also included in its entirety. Unfortunately, other excellent novels are not represented here, but that’s understandable due to space concerns. Labor provides a detailed chronology of London’s life, and an introductory essay that puts these varied works into context. The result is not merely a showcase of London’s best work, but a volume that gives an excellent overview of the man’s life, the stages in his literary career, and the development of his politics and philosophy. For diehard London fans, if you can only fit one book in your carry-on bag, this is a great volume to have with you. For those who have never read London before, this book makes a great introduction to the man and his art. If you like this review, please follow the link below to amazon.com and give me a "helpful" vote. Thanks.